As part of our commitment to provide truly superior service, Xtrade (the "Company" or "we") will make every effort necessary to ensure that withdrawal requests are processed quickly and efficiently. To protect against fraud, we may also request additional information. We utilize industry leading security and encryption technologies available to ensure that transactions and financial information are kept secure. *Please note that your account must be fully verified prior to the withdrawal process. A list of documents required can be found here. In some cases, the Company reserves the right to request some additional documents. *Please note that your account must be fully verified prior to the withdrawal process. A list of documents required can be found here. In some cases, Company reserves the right to request some additional documents. **Your withdrawal shall be processed via the same method that the deposit was made. If you deposit via credit card, any withdrawal amounts will be returned to that credit card. Likewise, if a deposit is made via bank transfer, the withdrawals will be transferred back to your bank account. Other deposits made by e-wallet will be returned as a bank transfer or by Skrill/Netteler e-wallet. ***All profits will be returned via bank transfer. (The profit amount less than $150 might be transferred by any other method approved by the Company, subject to regulation). How do I check status of my withdrawal request? 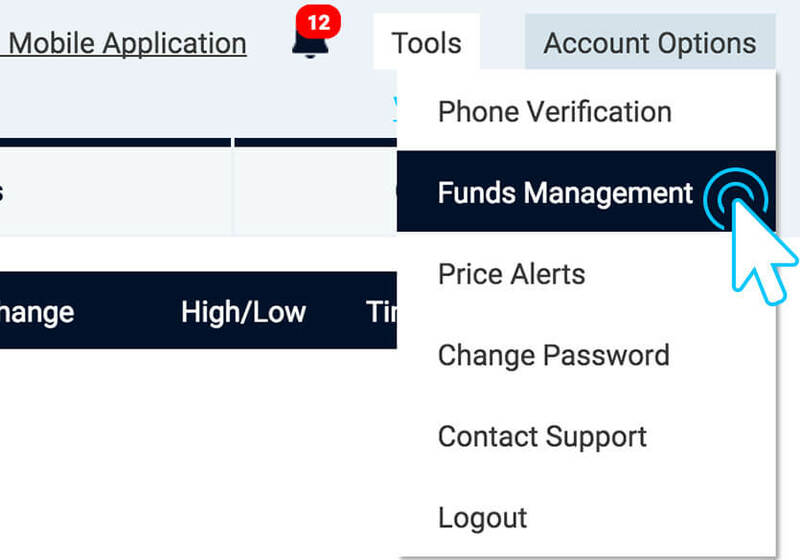 Click Account Options > Funds Management > Withdrawal requests. 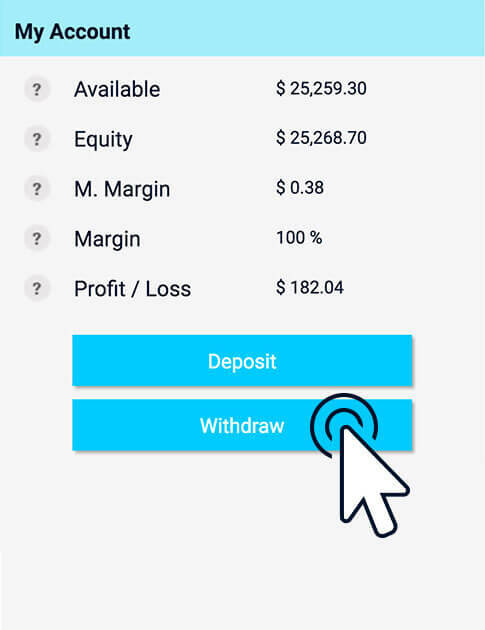 You will see a new pop up window with full details of your withdrawal. 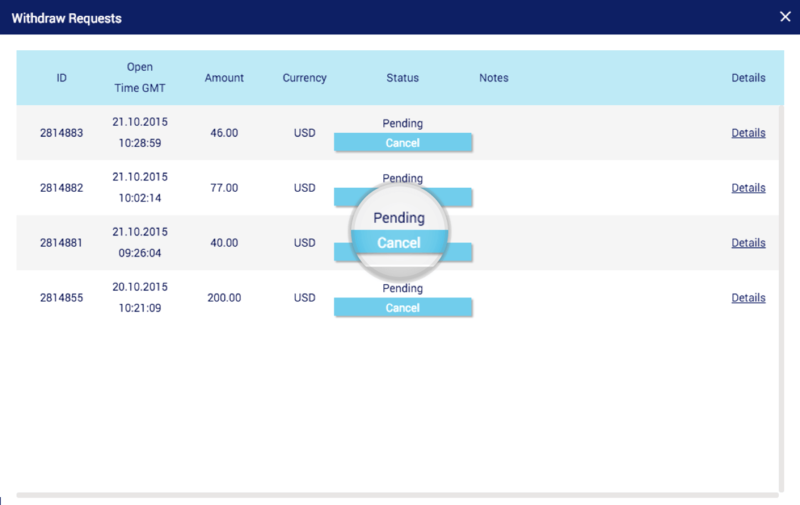 *Please note that you can cancel your request at any time while its status is "pending"
Why a withdrawal was rejected? Your account is not fully verified. We did not received a signed withdrawal form. We were unable to transfer funds to the Bank/e-wallet details provided or we did not receive correct details at all. 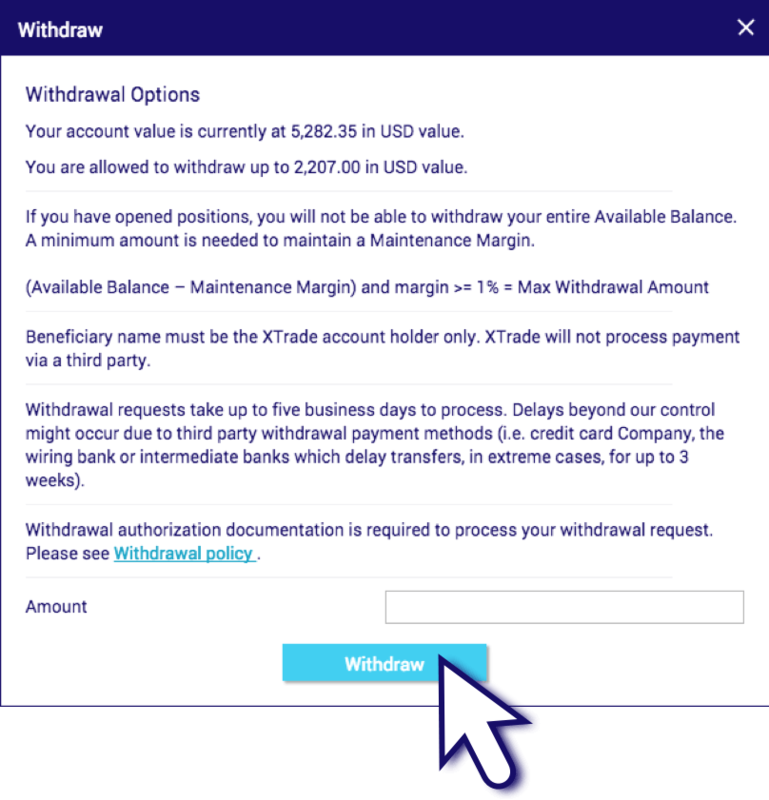 Xtrade does not charges any fees for withdrawal processing. The total withdrawal amount will be transferred to your bank account, credit/debit card or e-wallet, however banks and/or intermediaries banks, processor's fees may apply. We do not accept any responsibility for such fees. Our Client Support team is ready to help you with any questions you may have to make your online trading experience as pleasant and convenient as possible, 24 hours a day, 5 days a week. Please contact us with any questions you may have.